Tillbringa en dag nedsänkt i franska WWI-historien med ett besök på Arras och Vimy från Paris. 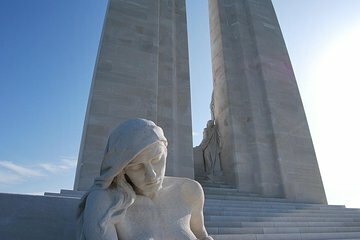 På den här helgedagsturen ser du kända slagfält i Nord-Pas-de-Calais, besök minnesmärken som Cabaret-Rouge British Cemetery i Souchez och Canadian Canadian Vimy Memorial och lär dig fascinerande detaljer om WWI från din guide. Njut av personlig turné med din lilla grupp samt ledig tid att utforska Arras, hem till Monchy-Le-Preux Memorial. Nicola was a very knowledgeable and affable guide. She was able to bring home the horror and magnitude of loss of WW1. We were all Canadians on this trip so she tailored the information to our interests. Her historical knowledge is encyclopedic! We visited several national grave sites, the Vimy memorial, the Canadian centre where the trenches are, and then Arras. This trip is a must for any Canadian. It's a long day but well worth it. We arrived at at Vimy at 10:25 and were given 30 minutes to walk amongst the monument. Vimy itself is beautiful and emotionally thought provoking. We were then told we needed to be at the visitor centre which opened at 11 so we could be on the first tour of the trenches. Apparently, you can not prebook the trench tours. A guide takes 25 people down through the trenches on a first come basis. This tour is very worthwhile. When we arrived the visitor centre had a sign saying they would not open until 12, not 11 as we were told. Our guide had to scramble and find something for us to do for an hour, so we visited a small cemetery and walked through a recently dug farmers field to see if we could discover some artifacts. When we arrived back to the visitors centre we then found out that the first trench tour would not be until 1:00. I do not understand how the tour guide and tour company did not know that their itinerary was incorrect by 2 hours. We had an hour in the visitor centre which was too much time. The centre is fairly small and self explanatory. While at the visitor centre, I came across information about the monument that would have been nice to know while we were walking amongst the monument itself. Our guide was a lovely lady but was not very knowledgeable about Vimy and the historical aspect of the trip. For the 591 we paid we were expecting to have our guide provide us with additional historical insight. We arrived for lunch in Arras around 2:15 and due to the delay at Vimy we had a little over an hour in Arras. Vimy itself was worthwhile seeing but this trip was very disappointing. We had done another tour in Edinburgh the last week in September with another company that was a quarter of the cost and far more informative. This trip turned out to be a very expensive bus ride, not a tour with all kinds of scheduling issues and a guide that was not very knowledgeable about the historical content of this tour. I would try and find another way to see Vimy. We thoroughly enjoy our tour of Vimy Ridge. The guide was very knowledgeable and had excellent communications skills. We had a great day. Although our guide had to be changed at the last minute to a chap whose specialty was The Somme, I was impressed with the depth and breadth of his knowledge about the Vimy battle as well. I was glad we started with the poignant pilgrimage to a number of Allied as well as German cemeteries. The loss of hundreds of thousands of young men in a war that resolved nothing was staggering. Of particular interest was the German cemetery with its stark rows of black crosses sprinkled with a few domed white ones with a Star of David. Even in death it seemed a point had been made: they were not true Germans. Had these young Jewish men survived these battles, I believe they would have been subjected to the death camps a few years later. When we finally arrived at Vimy, we went through the tunnels, a claustrophobic experience and one that would have been terrifying to the young men huddled in the dark for days, imagining the fate that faced them once they poured through the doors and into the trenches. Of course, the highlight was the stunning and stark white monument itself that towered over the ridge itself. More than one in the tour left with a bit of a tear in their eye. Excellent trip with and excellent guide: Sylvain. Vimy is a pilgrimage for any Canadian. Very interesting visit. We were well looked after by Sylvain with lots of information. I recommend to anyone. Long day but lots of interesting things to see and ponder! Nicola was fantastic, she is knowledgable, answered all of our questions and explained a number of things. Our children learned a lot about WW1 and how Canada was an important part of history. The lunch in Arras was terrific, a bit more time to shop there would have been good, but understandable. This is a tour every Canadian should go on to better appreciate the bravery and sacrifices made at Vimy Ridge. 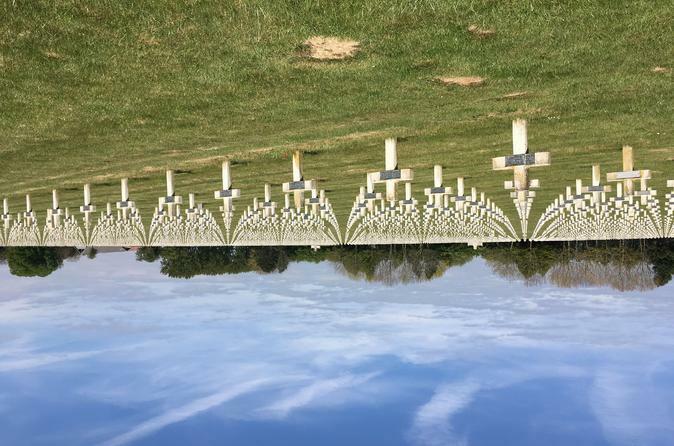 Visiting a few of the over 600 cemeteries in Northern France, our tour included the Cabaret Rouge British Cemetery as well as the German cemetery, Neuville-St. Vaast. The knowledgeable Nicola, provided us with a great recounting of the Canadian military strategy and events leading up to this pivotal battle. The monument itself is an amazing tribute of our nation's grief and respect for all the lives lost. My daughter and I will never forget this visit. This was a very informative trip. Our guide, Nicola, was very knowledgeable, and also a lot of fun. The places we stopped at on the way to Vimy Eodge were very interesting, and sobering. We would highly recommend this tour. Wonderful experience. Even if you had no one directly related to you who participated in this battle, you cannot help but to be moved by the sacrifice and courage by the troops who helped win this significant battle. It makes you appreciate the times you live in so much more after visiting these places and learning more about the historic significance of this epic battle. Our tour guide had a degree in history, which made every story and event spoken of come alive.